This is the latest accepted revision, reviewed on 2 March 2019. For the given name, see Marcie (given name). Marcie, unofficially surnamed Johnson and Carlin, is a fictional character featured in the long-running syndicated daily and Sunday comic strip Peanuts by Charles M. Schulz. Marcie is a studious girl who is sometimes depicted as being terrible at sports. She has befriended the tomboyish, athletic Peppermint Patty, and she has a mostly-unrequited crush on the underdog Charlie Brown. Marcie has appeared outside the comic strip, featured in numerous Peanuts television specials, cinematic films, theatrical plays, and video games. Marcie made her first appearance in the daily strip from July 20, 1971, but her name wasn't mentioned until the strip from October 11. The character was modeled after Elise Gallaway, the roommate of Patty Swanson, Charles M. Schulz's cousin and the inspiration for the Peppermint Patty character. 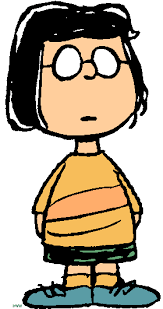 Marcie first appeared on television in the 1973 special There's No Time for Love, Charlie Brown. A forerunner of Marcie's character, a girl named Clara, made an appearance in a sequence at a girls’ camp in June 1968. As Marcie became a part of the regular cast, she appeared in the same class as Peppermint Patty, sitting in the desk behind her. In the animated special You're In the Super Bowl, Charlie Brown, Marcie's surname is given as "Johnson", but Schulz never gave her a surname in the comic strip. In the 2015 The Peanuts Movie, for which Schulz's son, Craig Schulz, and Schulz's grandson, Bryan Schulz, were included among the film's writers and producers, both had decided to include for the first time the full name of the character "Marcie Carlin", which appears on a bulletin board at the kids' school. On the test score list in the movie, the name "Marcie Carlin" is used. Marcie was a soft-spoken voice of reason to Peppermint Patty; an example of this showed in the 1973 Emmy Award winning special A Charlie Brown Thanksgiving; when Peppermint Patty throws a fit about the "dinner" Charlie Brown made for them, Marcie gently reminds her that he didn't invite her to dinner, but she invited herself. However, she is sometimes portrayed as being somewhat naive as showed It's the Easter Beagle, Charlie Brown when Marcie showed complete ineptitude in the kitchen, making several unsuccessful attempts at preparing eggs to color for Easter, and then later biting into one without removing the shell first (saying "Tastes terrible, sir"), all to Peppermint Patty's great consternation. Later, Marcie was portrayed as an overachiever (she once quipped that she had already chosen her college and enrolled her three children in preschool) and academically the brightest of the Peanuts cast. Even so, she is possibly the most credulous and naïve of the gang. She apparently is under a great deal of pressure from her parents to excel in school, and, in a story in 1990, sought refuge from her demanding parents at Charlie Brown's house and fell asleep on his couch. The first actor to perform Marcie's voice in the TV specials was a boy, James Ahrens, from 1973 to 1977. Various others have played Marcie since. As with all of the Peanuts performers who were too young to read a script, director Bill Meléndez sometimes had to speak the children's lines to them. Meléndez (who had a distinct Mexican accent) noted with amusement that some of the performers for Marcie imitated his reading so closely, they repeated his accented "Charlce" instead of "Charles". Marcie wears round glasses with opaque lenses and wears her dark brown (sometimes black) hair in a short bob style. She also wears an orange t-shirt (colored red in The Peanuts Movie). She and Peppermint Patty were the only girls in the strip to wear a t-shirt and shorts (although Lucy and Sally wore pants during the winter in the 90s’ strips, and Eudora wore pants regularly). Marcie is best friends with Peppermint Patty, constantly addressing her as "sir" (she called her "sir" in her first line in the strip). Originally, Peppermint Patty kept telling Marcie to stop calling her that, but eventually grew accustomed to it. Initially, Peppermint Patty addressed Marcie as "dorky" and, when talking to others, referred to her as "my weird friend from camp". Because of the close friendship between Marcie and Peppermint Patty, some have inferred a romantic relationship between them. Marcie is essentially the complete opposite of Peppermint Patty: where Peppermint Patty is more comfortable playing sports, the well-read Marcie prefers a quieter, more studious existence. Although Marcie repeatedly professes her dislike of sports, particularly baseball, she will occasionally take part in whatever sport Peppermint Patty is involved in at the time, though more often than not, Marcie, upon showing her lack of athletic prowess and lack of knowledge of the game, usually only succeeds in frustrating Peppermint Patty. Her ineptitude at sports was not consistently carried over in the prime-time animated TV specials in which the Peanuts cast was featured. In the special You're the Greatest, Charlie Brown, she proved quite capable on the athletic field, even winning the decathlon for the school. However, Schulz did not consider these to be canonical. Like Peppermint Patty, Marcie also has an unrequited crush on Charlie Brown (whom she usually calls "Charles", or occasionally "Chuck", as Peppermint Patty does); she once confessed a fondness for Charlie Brown and would be willing to marry him if he asked her. While Peppermint Patty is more likely to flirt with Charlie Brown and play mind games with him, Marcie is more frank in her admissions of her feelings, and often asks Charlie Brown in plain language if he likes her. As he does with Peppermint Patty, Charlie Brown often responds to Marcie's inquiries by trying to evade the issue -- though it appears as if he has feelings for her -- which more than once has made Marcie so angry that she kicked him in the shins in frustration. She has on more than one occasion kissed Charlie Brown on the cheek. The first time was in the 1973 special There's No Time for Love, Charlie Brown, but she only did it so Charlie Brown could pretend that it was a goodnight kiss from Peppermint Patty. She also kissed him in the specials Happy New Year, Charlie Brown! (1986) and He's a Bully, Charlie Brown (2006), and in "The Wright Brothers" episode of This Is America, Charlie Brown. She also kissed him in the strip in the "Lost Ballfield" story arc in 1982. Marcie and Peppermint Patty also shared a crush on a boy named Pierre in the animated movie Bon Voyage, Charlie Brown (And Don't Come Back!!). Although Marcie was the one in whom Pierre seemed to express interest, Peppermint Patty misread the signs and seemed convinced that Pierre liked her instead. Though Marcie is usually slow to anger, she can occasionally lose her temper when provoked. Case in point, in a sequence from July–August 1973, when she reluctantly joins Peppermint Patty's baseball team, she becomes the target of a male teammate named Thibault (pronounced TEE-bo), who constantly follows her around tormenting her with chauvinistic insults until she ultimately slaps him senseless. Thibault completely ignored the fact that Peppermint Patty was also a girl. Another example from the spring of 1974 was when Peppermint Patty, in protest, refused to go to school, holding vigil on top of Snoopy's doghouse (which Patty still referred to as Chuck's guest cottage). Eventually Marcie's anger again got the better of her and, while pulling Peppermint Patty down, destroyed the doghouse. In so doing, Marcie also made Peppermint Patty face the reality that Snoopy was a beagle, and not the "funny-looking kid with the big nose" that Peppermint Patty often referred to him as. Marcie has been played by many voice actors in animated Peanuts productions. ^ Michaelis, Davis (2008). Schulz and Peanuts: A Biography. Harper Perennial. p. 335. ISBN 0060937998. ^ Derrick Bang. "Peanuts FAQ". ^ Wong, Kevin. "How Peanuts Used Marcie To Explore Unhealthy Relationships". Retrieved 20 March 2017. ^ Andreoli, Richard (2004). Mondo Homo: Your Essential Guide to Queer Pop Culture. Alyson Publishing. p. 27. ISBN 1-55583-862-6. "Marcie: Character Facts, Comics and Videos". This page was last edited on 2 March 2019, at 23:42 (UTC).